But how do we expand our access to more and more students and provide them with better tools while at the same time keeping the costs of a university education at reasonable levels? We need to embrace expansion, growth, and new technologies, but how do we do this without raising costs and limiting access to people in the state, regardless of economic challenge, who desire a college education? One of my favorite television actresses, Marilu Henner, once said that “Like it or not, the world evolves, priorities change and so do you.” It’s a simple concept, but the truth is that many of us are fixed in cement once we write down a prioritized list of goals. It’s not easy to be flexible with our goals. We may feel that others will criticize us for weakness or lack of focus. At the same time, we must take advantage of windows of opportunity and move our current priorities forward with intentionality and speed when an opening appears. Winston Churchill, one of the greatest leaders of the 20th century, once said that “We make a living by what we get, but we make a life by what we give.” I think what he meant by this statement was that the act of giving to people and organizations dear to our hearts enriches not just the recipient but also the giver. Generosity allows us to see more clearly that the world is much bigger than ourselves. This lyrical wordsmithing by the poet could well describe the Oviatt Library over the past 2 years, and especially this fall season. Perhaps it is because September often brings with it the beginning of the school year, but many of us associate autumn with change and newness. This issue of the Library eNews will focus on some of the changes in the Oviatt that are re-making our space and bringing new life to an old, familiar place. In this issue of the Oviatt Library eNews you will see that there is indeed beauty and strength among the individuals, young and old, who serve CSUN students through the resources, services, and facilities of the Oviatt Library. John F. Kennedy once said that “partnership is more than a sharing of power,” and he was right. Partnership brings together allies who, once combined, form much more than the sum of their individual parts. Good partners create new ways of seeing the world and new kinds of initiatives. Creative partners look beyond the mundane and see a vision for a fruitful future. Productive partners put aside individual differences, pool resources, and work together for the good of the whole. When entering the newly renovated Library lobby, the visual changes are nothing short of stunning. When standing just inside the front doors on the south-facing structure, patrons now encounter unobstructed sightlines to the long wall of glass windows on the north side of the building. This newly opened view to the outside gives visitors a sense that the massive edifice that they just entered is somehow miraculously floating just above them. 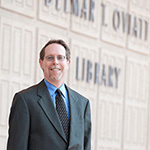 As the Oviatt looks toward a future that will undoubtedly bring with it new challenges in how information resources are managed and kept easily accessible, this expanded view will be nice and attractive. What will be necessary, however, is a clearly focused vision. One of the things that I love most about being a librarian and library administrator at Cal State Northridge is the knowledge that every day will bring something new and exciting into my life. This issue of the Oviatt Library E-Newsletter exemplifies that feeling of sheer exhilaration when I think about the wide variety of initiatives that the Library is involved with this year.